"I would be put (back) on Zoladex, I was told, which is a drug that puts your ovaries to sleep. Zoladex isnot covered by OHIP. The oncologist wasn’t sure if it would help, but he figured we should try that first and foremost before doing anything else. Except. . . except that monthly shot costs about 500 bucks a pop. Or I could pay 1500 a go and get the three month shot. That is seriously what I was told. And if this post seems a bit fragmented in pace, it’s because to this day I’m stupefied by the solution to my struggling to afford medication – cut out perfectly healthy pieces of my body, despite there being an effective pill that could do the same thing minus the traumatic surgery." This is mind-boggling. Being submitted to unnecessary surgery at a much higher cost to the system than covering the drug would have been. And at a much greater risk to the patient. Ultimately, Catherine was able to qualify for Trillium but with a significant deductible - one she would never have had to pay if she opted for surgery or another kind of treatment. Catherine supports the campaign at FairCancerCare.ca. She's signed our petition and is now helping to spread the word. P.S. : Catherine is also a novelist. I've read her book and it's lovely. You should check that out, too. 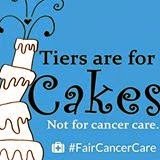 As, I mentioned in my last post, I've been working on a campaign called Fair Cancer Care. We're hoping to create awareness, followed by change to how chemotherapy drugs are covered in Ontario. We launched in time for the provincial election campaign, in the hopes that we can get our local candidates to take an interest. You can find out more at FairCancerCare.ca. The people behind the campaign are a group of Ottawa residents who have all been affected by cancer. We've all been promoting the hell out of this campaign as the election date draws nearer. My good friend Andrea is a driving force in our group. Her creativity has been key to getting us moving and, as someone who lived through breast cancer, she gets how crucial it is to ensure that everyone gets the best care available. Yesterday, Andrea had the following exchange via email with someone she knows slightly, who'd been asked to sign our petition. I share the following exchange with Andrea's permission. For the purposes of clarity and my own amusement, we'll call the other person Ms. Smug Hubris. SH: "I don't believe that cancer causing radiation and toxic chemotherapy is the cure for cancer. Healthy whole food and a healthy lifestyle is." Andrea: "I thought the exact same thing before I got it. Wishing you continued good health." Although my response was much cruder (rhymes with "Oh duck off"), I think Andrea was perfect. While Ms. SH is entitled to her opinion, I'll continue to fight for the very best cancer care to be available to everyone. Because the thing is, anyone can get cancer. I've known several extremely healthy living, eating and drinking people who've been hit by a cancer diagnosis. I know people who did everything right before and after that diagnosis and died anyway. We need a cure for cancer. But until then, we need the very best chemotherapies to be available as soon as they are approved. And everyone should have access to the treatment their oncologist prescribes, regardless of ability to pay. 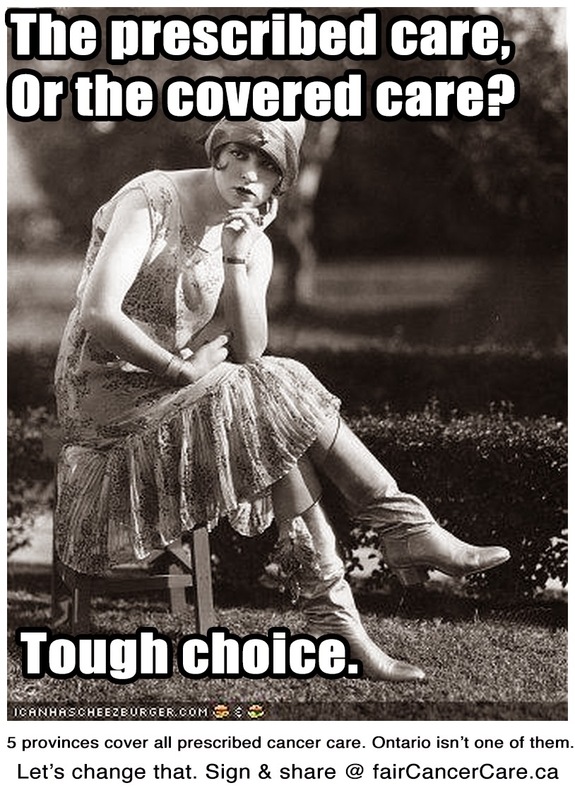 Ms. Smug Hubris can chose whether or not to seek treatment, should she be unlucky enough to get cancer. We'll keep working to make sure it's available. 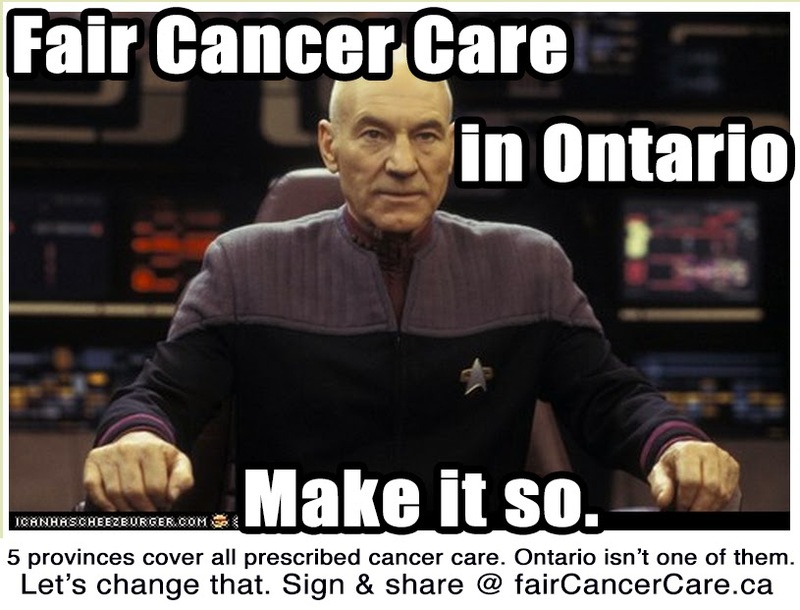 To learn more and sign our petition, please visit FairCancerCare.ca. You can like us on Facebook, too. 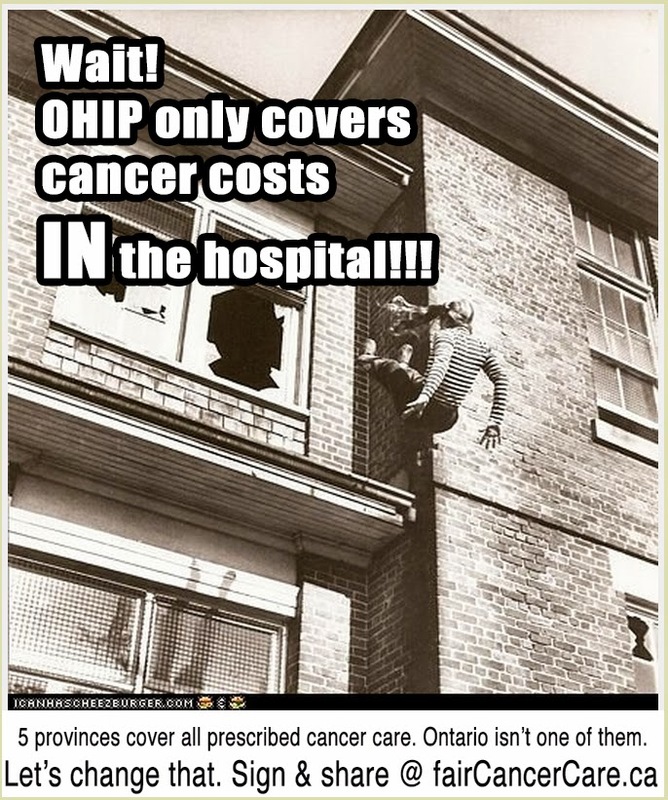 In Canada, we tend to think that, should be unlucky enough to get cancer, our health care system will cover the cost. For thousands of Canadians, this is not the case. Ontario is heading into a provincial election. Will you sign our petition to ensure everyone has access to the best care their oncologist prescribes for them? Will you ask the candidates for support when they call you or come to your door? To find out more, please go to FairCancerCare.ca. You can sign our petition or find out some of numbers beside these facts. Please take two minutes out of your day and check out our campaign. The next person to find themselves without coverage could be you. Or someone you love. On Tuesday night, I had the privilege to participate in Blog Out Loud Ottawa. This was my third time attending and my first as a reader. I was very nervous. But it was a wonderful experience. Tim and Sacha (my teenage son) attended as well as several supportive friends (I hope they realize how buoyed I was by their presence). My reading went very well. The crowd was so supportive that they made it easy. It certainly sounded better to me than it ever did in practice. If you're a blogger and you ever get the chance to read in front of a supportive group - do it! I read a post called "learning to breathe'" that resonated with a lot of people when I first posted it. It was written last November, a year after my brain surgery. As I said at the beginning of my reading, "...each blog post is a snapshot of my life at the time of writing. If I were to take a snapshot today, it would show how far I've come." I am more willing to face my anxiety. It's a really good feeling to aware of this progress. My blogging over the last year has been pretty sporadic. And I'm not sure what the future holds. But I know I want to keep writing. And sharing. I am so grateful to BOLO organizer Lynn Jatania, to Ottawa's blogging community and to the Writers Festival for the renewed inspiration. Stay tuned. I'm pretty sure more change lies ahead. Upate: BOLO has posted links to all the posts from Tuesday night. And look! That's me on stage in my red dress. Here is the statement I made at today's press conference (see below for details). 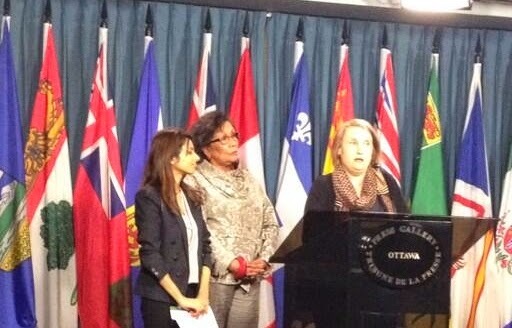 Thanks so much to Dr. Hedy Fry for introducing the Private Members' Bill and especially to the Canadian Breast Cancer Network for being a tireless advocate for women living with metastasis. Before my own diagnosis, I would have said the same thing. I learned I had breast cancer in 2006, when I was 38 years old, with two little kids. Three months aftIer I completed treatment, the cancer had spread to my liver. However, I responded well to treatment and 7 months later was in full remission. In November 2012, I was diagnosed with a metastasis to my brain. After conventional and cyber knife surgeries, I was once again able to embrace the words “no evidence of disease.” I will be in treatment for the rest of my life and, as there are no drugs that effectively cross the brain-blood barrier, I live from scan to scan trying not to dwell on the inevitability of the next brain tumour. This is my story. I have known far too many incredible young women, who have done everything they were supposed to do to be healthy and who have not lived to share theirs. Like most women living with metastatic breast cancer, I hate the onslaught of pink that hits us every October. I don't feel that all the talk of “feeling your boobies”, of battles won and lost has much to do with me. Much more relevant to me are clinical trials, drug coverage, quality of life and the long term effects of treatment. The prevailing theme during Breast Cancer Awareness month, or as many of us call it, “Pinktober”is “stay positive, get through it and then move on.” For those of us living with mets, for whom moving on will never be an option, the unintended message is that we have somehow failed at having cancer. Despite – or perhaps because metastatic breast cancer is stage 4 (there is no stage 5), very little emphasis is placed on metastasis in fundraising or awareness campaigns. The specter of death doesn't feel very hopeful. Yet that is where the emphasis should be. While it's true that there has been very little decline in the number of deaths from breast cancer in the last couple of decades, many more of us are living longer. And that is very hopeful. 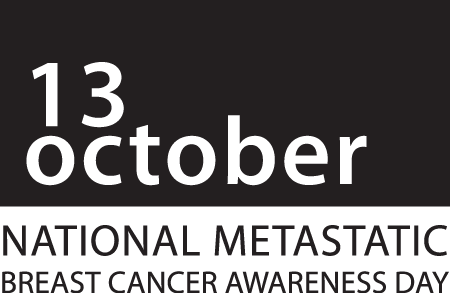 It is in understanding and committing research to end metastatic breast cancer that we will really find a cure. Given that, it doesn't seem very greedy to be asking for one day every year."